The international standard for the distance between the blades to the floor is ideally 7 - 8 feet. The original height of most ceiling fan models are 1 foot only, therefore an 8 feet ceiling is suitable for installation. 2. If the ceiling is higher than 9 feet, an accessory down rod may needed to bring the fan to the appropriate level. 8 - 8.5 feet ceiling 24" - 26" 34" - 36” 36" - 40” 42” - 44” 48” - 52"
2. Structures on a ceiling can impact the airflow. There should be at least 1 foot or more clearance between the blade tips to any ceiling beam or wall to reduce this impact. 3. The diameter of a fan may look large on a tape-measure, but as a fan is not a solid round object like a table, and is installed on the ceiling, a fan will often smaller once installed. A fan that is too small for a room will be ineffective and inefficient. 4. If the room is a rectangle shape, 2 fans may be needed for even airflow. The fan size can be based on the dimensions of the narrow side of the room by forming a square for the purposes of calculating size. Lighting is an option and available as an optional accessory in most ceiling fan models. Some models have a lighting option built-in already while some are not light adaptable. Remote and Recevier are for convenient operation or sometimes it is neccessary in some installation situations. Please see the following diagram for details. Remote and Receiver are included in some ceiling fan models. * Requires 2 sets of wiring inside the wall. Installation service does not include the installation of additional wiring. ^ Fan switch is not included with pull cord fans, and can be purchased as accessory if needed. • A remote includes a handset and a receiver. The receiver will be installed internally during installation. • Remote control and wall control cannot be used in conjunction with one another. 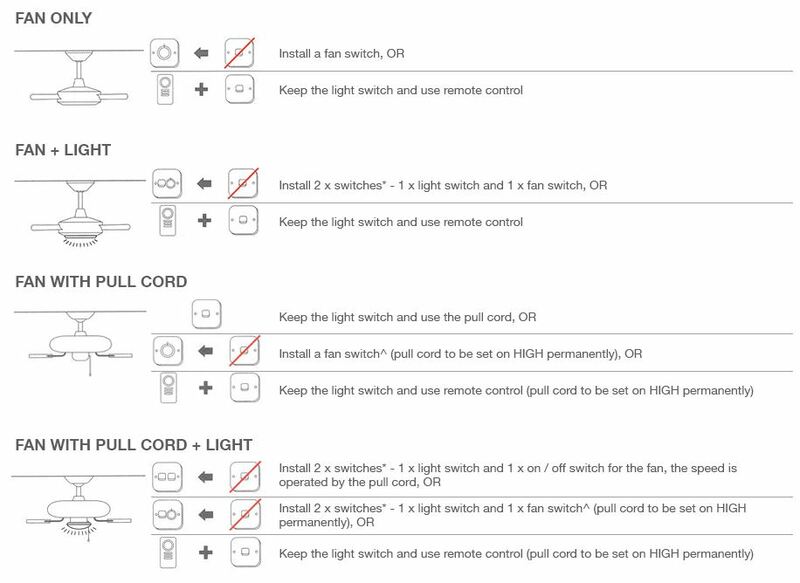 • If more than 1 fan is installed in the same location, each fan should requires an individual remote control set on an independent frequency. • Fan switch installation is subject to the space available inside the wall cavity. If the ceiling is higher than 9 feet, an accessory Extension Down Rod may needed to bring the fan to the appropriate level. If the location has a slope ceiling and the angle is greater than the original fan can be installed at, a Slope Ceiling Kit is required to install with the ceiling fan. The maximum degree of a Slope Ceiling Kit is 45.